Unay is taller and broader than her older sister, with a sturdy, muscular build and shoulders born of Turns of smith work. Despite being not especially tall in general, she's also clearly not a weakling, and dresses to show this fact off. She prefers sleeveless shirts, so as not to restrict the movement of her shoulders, and heavy, heat-resistant pants. Despite her mode of dress, she's clearly feminine. Her red hair is generally pulled back and out of the way, but still allowed to grow long. When let down, which is rarely, it's wavy, though for the most part it's frizzed by the dry heat of the forges. She has an oval-shaped face with a somewhat narrow, slightly upturned nose. She's pale, though not especially freckled, and burns in the sun. Her eyes are a dim sort of green, edging toward hazel, and her eyelashes are short and as red as her hair. Whatever sort of person Unay was, or was destined to be before Alayna was kidnapped, is long gone now. All she knows now is hate: hatred for Benden, hatred for the bronzeriders that threatened her family, hatred for the fact that people stood by and let it happen. She's determined to never stand by again. Her mind is consumed by thoughts of vengeance, of ensuring that the people who hurt her and her family feel as much pain as they did. She's persistent and resourceful, unwilling to give up on anything and good at making use of whatever she has on hand to achieve her aims. She's short-tempered, and rarely in control of her emotions. She wears her feelings plainly on her sleeve and they're a whirlwind. Nothing comes in half measures; when she fights, she aims to kill or permanently injure. When she cares for a person, nothing can tear that regard from her. Politeness is an afterthought. She says what needs to be said without thought for who she might offend. She does what needs doing regardless of what rules it might break. All of her old hobbies have been forgotten in favor of her covert training with a blade. They can't even begin to compare with the importance of seeing the Benden elites suffer for what they've done. The only thing she kept up with was her Smithcraft, and that was only because it provided useful strength training and a lot of time to think. It was better than doing nothing at all. Unay, the second child born to a pair of riders, had a relatively happy childhood. She wanted for nothing, and was showered with her parents' affection. She apprenticed fairly young to the Smithcraft, for she showed an inclination toward making things and a surprising strength for her size. The masters thought her to be jewelsmith material; she was determined to work with iron and steel, and spent many hours training until she was able to swing the hammers heavy enough to move the stiffer metal. She was happy. The war was over and she had a purpose, a family, and a path to a future full of the odd, metal smell of a forge and the thudding and ringing of hammers. She could make useful things, and enjoyed presenting her family with little gifts. Sometimes she even made jewelry, though she was determined not to allow the masters to know she had even a little interest in that. She never stood as a Candidate, but her older sister did. That was fine; she was content in her forge, and had no wish to follow in their parents' footsteps. Dragons were fine, and they made an excellent motif for decorative work, but she didn't particularly want one. But Alayna did, and not only Impressed, but to a gold. Unay saw less of her after that. She had more important things to attend to then, like irritating all of the senior leadership of the Weyr. Unay didn't blame her; she was half tempted to say those things herself, but she took her frustrations out on metal anyhow and kept her mouth shut. Until one day Alayna just disappeared, and Alayune not long after. It was as though they had never existed. Asking after them only earned her a beating that left her unable to work for days, and a reminder that it wasn't the place of one who wasn't a rider to ask the leadership about a family member. And so the inferno of resentment that eventually grew to overtake all of her was sparked, and every day of her sister's absence made it grow fiercer. She stopped caring about what she made. She would strike back against the leadership, against all the riders of Benden if she had to, and she focused solely on large projects. The ones that would force her to swing a hammer for hours on end, and so grow stronger. She wasn't allowed knives; her room was periodically searched while she was gone, and she didn't miss that there were occasionally riders making certain she didn't take anything with her from the forge. The fact that they clearly underestimated what a hammer could do to a person occasionally made her smile a twisted sort of smile. For Turns this continued. Her temper grew shorter, and she continued to work herself to exhaustion because anything less and she might just decide to march on the leadership's noonday meal and kill them all. It was a temptation she knew she couldn't give in to. Not until she knew her sister was safe, at least, though she was starting to suspect that Alayna and Wyzeth were both dead. Then one day her work in the forge was interrupted by a pair of bronzeriders. They didn't say anything, just started to drag her away. She fought back with every tool she had at her disposal, which was a lot, while the other smiths just stood by and watched. She downed one of the riders, but the other one scored a slash on her thigh and, when she went down, several kicks until she could no longer fight back. She was dragged to a cell and placed with her parents and told that they were being punished for Alayna's disobedience. She suspected the three of them were just going to rot there. No Healers were sent for her, so it was clear they didn't care what happened to them. She started planning. Her left wrist was clearly fractured, and several ribs. She couldn't stand. But she was strong, stronger than they'd expected. And she was right-handed. If they sent only a single guard, she'd kill them, and all three of them would escape. It would all work out, and they'd figure out where Alayna was and what she'd done and free her, too. But a guard didn't come; instead, it was one of her parents' wingmates, L'par, a man slightly older than they were, and he planned to get at least her out on dragonback, take her to where Benden had no influence. Her parents refused to leave without their dragons, but wished her luck. They made it only a short distance down the hall before they were discovered. Her parents came to help, distracted the guards in the hall so that she and L'par could escape. The last thing she saw of them was their prone bodies before the guards hurried after them again. She and L'par did escape, and made it to his blue while under fire from guards' arrows. Unay was struck in the bicep as she was helped into the blue's straps, and L'par in the back, but they made it airborne, and the blue winked between. They emerged in a place Unay didn't recognize, somewhere in the jungle. There, L'par promised her, she would be safe. And there he died of the arrow that had struck him, leaving her alone in a strange place the name of which she didn't even know. She didn't know her parents' fate, or where she was, or what she was meant to do now. A larger green, about the size of an average blue, Ekkunath is all powerful limbs. She is a strong, sturdy dragon who is built to be as hard to topple as the mountain. She feels like she is some ancient green, no matter what age she is. She is surprisingly fast for how stocky she is. She's powerful. She is wonderful. 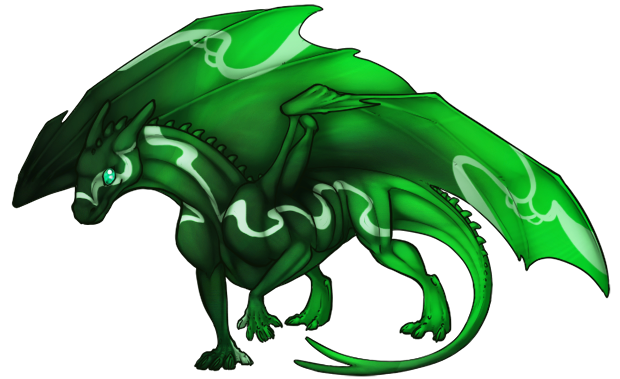 Her hide is a myriad of dark greens and brighter greens, with strange highlights on her body and a swirl that just kind of makes her look constantly backlit. Lighter, pale green ribbons trace over her face and sides, and over her wings in elaborate patterns like veins or magical streaks. Ekkunath cannot speak, but the rumblings in her mind sound like deep echoes in a canyon. Ekkunath always seems ancient. She is eternal. Even from a young age, she just seems so otherworldly without being tyrannical. No, she is just so odd. So strange and so strong. That sort of presence gives her a leadership air. She is a powerful commander and would be well-suited to lead a wing one day. She feels disconnected from her siblings, though she does care for them. She doesn't seem concerned with trivial things, and she will need someone to push her to attend lessons and learn things. To her human, Ekkunath may be distant, but she is very caring and kind. She is a strong, stubborn protector, and there is nothing on Pern that she fears. She cannot speak. She is not just a soldier, and she will strive to be more than what the rest of her siblings may aspire to be. She is no perfectionist and is happiest protecting someone or something. That is all she could want or ask for. She likes to sit on the Fireheights and just observe, and even though she is brightly colored, she is very good at being motionless and overlooked.